OK, it’s official…. this is the strongest beginners group we’ve ever had. You girls are fabulous! We’re doing extremely well and are right on track with our training program. I love this photo – look how happy everyone looks! We’ve gotten to a point where it will be very difficult for anyone to join the group. It’s near impossible for a beginner to step into 7 or 8 minute jogging intervals – so this is our group (plus those who weren’t there on the day). Over the next few weeks, we’ll probably start to notice a bit of pace differential within the group. This is fine and it’s to be expected. Each of us have individual gaits/running-styles and we have a natural pace. Those with a faster cadence (foot turn-over) or a longer stride need to start migrating to the front of the pack. It’s very important that you run your natural pace – if you are a faster runner and you slow down your pace, the action of “putting on your brakes” can cause knee and hip pain. I know that can be hard when you’ve grown used to running beside your closest friends in the group. The majority of this year’s group has a similar pace but we do have some faster and slower runners. This isn’t a contest so don’t worry about where you fall into the group!!!! Find your own pace. Follow Kavita’s lead! She’s doing a brilliant job of maintaining her own, individual pace. She’s doing exactly what I’m asking you to do – she’s found her own pace and is sticking with it. Our t-shirt order is ready to go in! Please check this google doc to make sure your order is correct – Click here for the link Kelli will be closing the edit function on the document at midnight on Monday night. Whatever is in the document at that time is our order. Check your details. Kelli and I have input/updated some payment information and size changes per your requests. I hope we didn’t make any mistakes, but if we did…. this is your last chance to catch it before the order is placed. If you have not made payment and have not spoken with me about that, please confirm that you do want a t-shirt. I’m happy to sort out finances later but I don’t want to order a shirt for you if you’ve changed your mind. Bratislava – Race registration is now open. It’s far from simple but it can be done. I tried doing it in English and the system hung up at step 2. In Slovak, it worked but I had to input a Slovakian zip code (try using 811 02 – just like that with a space between the 811 and the 02) with my London address. I can’t explain why but it’s the only way I could get it to work. It looks like there is no free shirt in our goodie bags. If you want a race shirt, you have to order one (€16) when you are signing up for the race. There is no rush to register so maybe I could bring my laptop to Bonnie’s house on 15 November and everyone could just line up and register for the race. Once you see someone else do it, it’s easier (easier but not easy!!!!). The cost of the race is €24 payable by credit card online. The cost slightly increases after 31 December. If you go ahead and register before 15 November, please input your club name as: WRW London (Women Running the World) so the race director will know that you are part of our group. Also, when it asks for your fastest half-marathon time, leave that field blank. I’m out-of-town from Thursday, 25 October, until Sunday night, 4 November, so will miss two runs with the group. I’m soooooo sad about that!!! I promise Syma, Bonnie and Betsy will take good care of you. On Thursday, 25 October, Darcy Fautz will be a guest coach for the day. Darcy trains with our Mon/Wed/Fri groups. She’s done a couple of half-marathons and a full marathon. Ask her for any tips/suggestions/training info; just like our other coaches, she’s a great source of information. On Tuesday, feel free to repeat the run to Big Ben or to do the running/walking intervals in Regents Park or on the canal. Next Thursday, 25 October, Syma will lead you down to Hyde Park and the following week, 1 November, the route will probably be along the canal. In case you are not able to run with the group on Thursday (25th), the map to the right is the approximate route. This is a great route to learn – once you can comfortably get down to Hyde Park, the running world is open to you! Hyde Park is huge. It gives us lots of route options. I’ll be back running with you on Thursday, 8 November. I’m was thinking we could do a run to Whole Foods on Kensington High Street. It’s a great place to finish a run. Whoever is available – stay for coffee and/or grocery shopping! Ladies, thank you so much for joining our group! You are all fabulous and I’m loving getting to know you. Please email or call if you have any questions or concerns. I’ll be out of touch completely from 26 October through 5 November while I’m away racing. If anything urgent comes up while I’m out-of-town, please contact Syma Qattan. I love our group!!! I wake up on Thursday mornings and think “Yay! It’s beginner running day!!”. I’m serious about that. We are really starting to settle into a routine which is fabulous and I love to see how committed you are to your running. People are meeting up outside of our scheduled time when they have meetings or appointments – it’s perfect! This could be the best beginner group yet (and no, I don’t say that every year). Ladies, I hope you’ve taken a moment to think about what you’ve already accomplished. Last week we ran for 28 minutes with 2 x 4 minute intervals and 4 x 5 minute intervals. That’s huge! 28 minutes is a lot of running. It’s a good idea to think back to week one from time to time. We struggled to jog for 60 seconds. This week we also got a taste of street running. 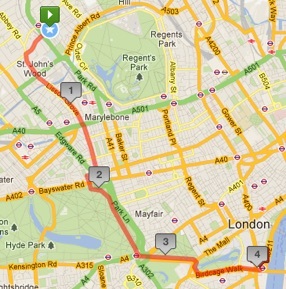 It’s nice to run in the park or on the canal, but now we’re running so far that we’ve “outgrown” Regents Park. Throughout the program, we’ll try to run as much as possible in the parks, along the river, along the canals but we always have to run the streets to get to those places. So it’s great to start practicing. on Thursday, this is a map of our route. 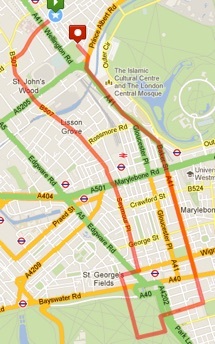 We’ll walk from Starbucks over to Lisson Grove then start heading south towards Hyde Park. We’ll do 5, 6, and 7 minute intervals but it won’t exactly work that precisely. With all the street crossings our intervals will be more broken up than that. Basically, the run to Big Ben should feel easier than our run last week. I’m serious about that. We’re going further, but we’ll have lots of little mini-breaks at lights. At the finish, we’ll take a few group photos and hopefully we can find a way to give everyone access to those photos. I’m not sure how to do that???? After the run, most of the group will head back to SJW for coffee (unless someone knows of a larger coffee shop in that area – the only one I know is the Costa or Nero and it’s tiny). Big Ben. Payment must be received by Friday, 19 October or your order will not be placed. If you haven’t had a chance to try on a sample shirt, the samples will be at the ASL Booster Store on Tuesday from 2:30-4:00. You could also leave an envelope at the ASL booster store with your payment. Please put it in an envelope and write your name and Running Group on the outside. DO NOT give your cash/cheque to the booster store workers or your funds could be comingled with store proceeds and your order will not be placed. If you want a shirt but are out-of-town or not able to send payment this week, let me know. We’ll sort something out. No worries! The race director was hoping to have race registration open on 1 October but that date has slipped by. He is hoping the online registration will be active in the next few days. I’ll let you know when it’s working. That’s it for this week. Please let me know if there’s anything I can do to help you with your running. One of the runners (Chris Roberts) from the Mon/Wed/Fri group has designed a t-shirt for the entire running group. The shirt is a black, short sleeved, dri-fit, Nike running shirt. It has the “Women Running the World” logo on the front. Chris will be at Starbucks after our run on Thursday, 11 October, with a sample of the shirt. On that day, we will have more information about the cost and ordering process. I think she negotiated a very good price. We have no uniforms or anything so you’re definitely not required to buy a shirt. They are just for fun. Order one if you’re interested! On Thursday, 15 November, we will finish our run at Bonnie Bandeen’s house for coffee in her garden. I will talk for a few minutes about our training program, the race in Bratislava and be available to answer any questions you have. We are such a large group that we rarely have room to sit at Starbucks after our run. So, thank you Bonnie for inviting us to your home! APPI will be offering a pilates class designed specifically for runners. Ladies, I cannot over-emphasize the importance of stretching, or doing yoga or pilates to offset some of the pounding we endure as runners. If you are interested, call Anna at APPI (0207 624 5314) and tell her which day/time would be convenient for you. They will attempt to group up people to create a few classes throughout the week. We are right on track with our training. Next week, we have some 5 minute running intervals. Is that crazy or what???? Who would have thought we could run 5 minutes???? The following week, Thursday, 18 October, we’ll be doing our first destination run to Big Ben and taking the tube home from Westminster. Some of you have mentioned that you’re worried about that first destination run. I promise we’ll be fine. Running through the city is great – there are dozens of street crossings and we get to take little mini-breaks at each light. I try to time the lights to our walking breaks, but it’s impossible – so you get a lot more rest periods. There is also something fun about running to a destination. The Costa shop there is tiny so we’ll probably take the tube back to St. John’s Wood for post-run coffee. The British Airways flights to Vienna continue to increase in price. Several of the MWF runners have booked the Ryan Air flight that arrives directly into Bratislava late Friday evening. They fly home on Monday on Ryan Air at 9:50am. Also several women have booked the two earlier BA flights on Friday, 22 March. I understand there may still be frequent flyer seats available for the early morning (7:25am) BA flight.